Chicken. Blah. Ok, maybe I should say we eat more chicken than we rightfully should, I mean we should have way more pork and beef in there somewhere, but chicken it more often times than not is. So with that we try to spice it up and give some flavor to the unflavorable, so today (actually last night) I set out to make a balsamic glazed grilled chicken. And I must admit it was rather tasty, albeit quite sweet, which for some reason I was not expecting. Once I got past the sweet and onto the rest of the chicken it was as I said rather tasty, very tender and juicy; which is always better than dry chicken. In hindsight I should have cooked my stuffing a little bit before shoving it in the bird. The breasts and thighs of the bird were ready about 20 minutes before the stuffing reached a safe temperature, which much to my surprise did not dry out the meat or give it even the slightest burnt taste. I grilled the bird on my Weber kettle over charcoal for about an hour and twenty minutes, the bird was just shy of 4 pounds. I replenished the charcoal once at about 45 minutes with six fresh briquettes on each side and a handful of apple chips. Once the breasts were about done I glazed the bird liberally and let it finish out its cooking, which because of the stuffing was longer than anticipated when I applied the glaze. But it didn’t seem to burn. To make a rub combine 2 tbsp brown sugar with paprika, chili powder, cumin, lime juice, oil salt and pepper. Mix well and rub all over chicken making sure to get plenty under the skin. Cover and refrigerate overnight. On cooking day remove chicken from refrigerator 30 minutes before cooking. Chop up onions into large pieces, chop celery, rosemary and garlic and combine in a bowl with pepper to taste. Sprinkle with balsamic vinegar and stuff in bird (if I were to listen to my advice I would likely bake the stuffing at this point prior to stuffing the bird for say 20 minutes in the over). Prepare the grill for indirect cooking, clean and lube the grate and toss the bird on the grill. 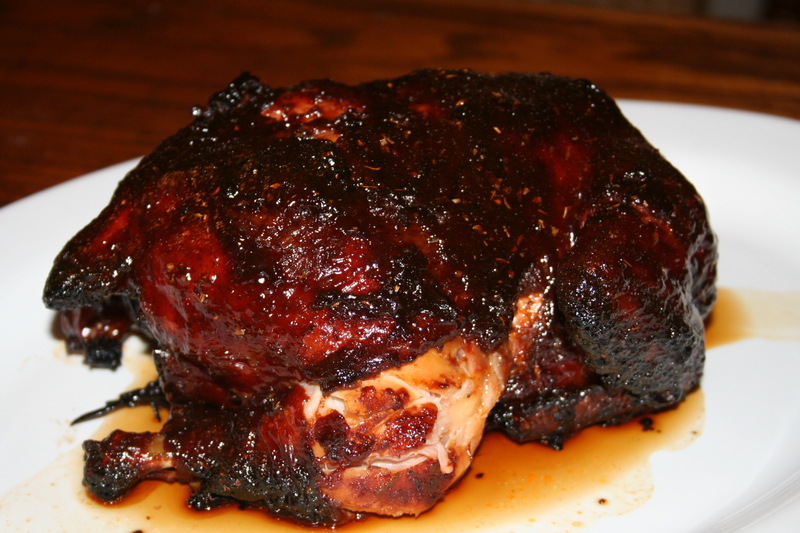 Once the chicken is on the grill prepare the glaze by combining ketchup, vinegar, 4 tbsp brown sugar and oregano. Without the glaze I dare say the chicken would have been quite south western but with the glaze it was sweet and magical. Now if I can just figure out what to do with the left overs.